Modern science has a rich history of elucidating the basic processes, relations and natural laws of the world around us. Much of this success has been achieved by specialized, reductionist research conducted within a single discipline. This, in turn, underlies the origin of modern differentiated research disciplines. Today’s researchers, with a specialized knowledge base and specialized skills, thus behave very differently from their ancient forebears in classical Greece—where ‘philosophy’ encompassed all major streams of thought, logic and ideas . The modern preference, in science, is to work within the comfort zone of a bounded discipline. Present-day human societies, however, face an increasing array of larger scale and complex challenges that are not amenable to resolution by single disciplines. While the basic processes of the natural world remain unchanged, the actual conditions of the world in which we live—both its structure and function—are undergoing increasing change as human pressures on the environment escalate . Simultaneously, the massive processes of urbanization, mechanization and globalization are changing patterns of living, communicating and moving. These large-scale changes to the natural, physical and social environments have diverse consequences for human health. The challenge to researchers is clear. We must seek to understand the dynamic behaviour of complex systems—environmental, ecological and social—and the many interactions between them. This requires new modes of thinking, studying and inter-disciplinary collaboration. This is a huge and exciting challenge for oncoming researchers. It presents a chance to contribute to the understanding of today’s momentous issues in ‘environmental health’ These include human-induced climate change, the sustainability of food-producing systems and the ways in which urban design and human ecology affect patterns of behaviour, mental health, relative weight and chronic disease risks. There is now an emerging recognition that our escalating impact on the world’s environment and its life-support systems poses risks to human wellbeing and health [3, 4]. Climate change, for example, already appears to be affecting health outcomes in some regions. This includes increases in exposures to more extreme weather events, an uptrend in deaths from heatwaves, shifts in the geography and seasonality of several infectious diseases, adverse mental health consequences in farming communities undergoing drying trends and downturns in food yields and nutritional health in vulnerable populations . This emerging recognition will become a central focus for social and economic policies, nationally and internationally, over the coming decade. Recognized risks to health are a potent political issue. Indeed, governments and international agencies are increasingly concerned that our faltering progress towards improved global health as well as the attainment of the United Nation’s (UN) Millennium Development Goals by 2015 will be jeopardized by this new, enlarged, dimension of environmental stress upon human populations . This situation presents a major and urgent challenge to the health research community to develop ways of studying these systemic threats to human health, quantifying risks and identifying preventive strategies. The evolution of assessment of risks posed by global climate change is instructive. In 1991 the UN’s Intergovernmental Panel on Climate Change (IPCC) published its first major scientific assessment . That report examined likely impacts on farmlands, fisheries, forests coastal zones, energy systems and other systems valued by human societies. Yet it contained little recognition that this unprecedented human-induced environmental change, occurring at global scale, posed serious risks to human health and survival. Indeed, this reflected the fact that, at that time, there had been scant research carried out on this relationship . The IPCC’s subsequent 5-yearly reports—1996, 2001 and 2007—have given progressively increasing emphasis to the human health risks from climate change. Indeed, in just the past several years there has been a clear upturn in recognition, by researchers and policy-makers, of the fundamental and serious threats to human wellbeing, health and survival from human-induced global environmental changes. Last year the UN Environment Program released its Global Environmental Outlook 2007 (‘GEO-4’). This voluminous report, drawing on the inputs of over 400 scientists, assessed in detail the current state and future prospects of Earth’s main environmental and ecological systems . The report explicitly concluded that social stability and human wellbeing, health and survival are now at increasing risk from climate change and other systemic environmental changes. The report documented worrying negative trends in the world’s fertile soils, freshwater supplies, coastal and reef ecosystems, fish stocks, concentrations of human-activated nitrogen (mostly from nitrogenous fertilizers and fossil fuel combustion), ocean acidity, numbers and stocks of species and the global climate. All of these changes, directly or indirectly, pose risks to population health. The World Wildlife Fund has recently estimated that the global human population is now using global environmental resources at approximately 1.25 times the regenerative and absorptive biocapacity of Planet Earth . On average, worldwide, there are currently 1.8 hectares of productive land surface available per person. Yet, already, the average demand is 2.2 hectares. That latter figure varies by a factor of ten between the countries with the largest ‘ecological footprints’ and those with the smallest. continuation of this trend will seriously impair the flow of Nature’s ‘goods and services’ to human societies, comprising: (1) provisioning (e.g. foods, freshwater flows), (2) regulating (e.g. flood control and the range and activity of infectious agents), (3) supporting (e.g. generation of hydropower and geothermal power) and (4) enriching local cultures (diverse examples include: seasonal festivals, animal migratory events, and totemic species). This situation poses a challenge to environmental scientists, epidemiologists and public health persons. Modern urbanized societies have been slow to recognize the particular significance of global climate change and the other associated global environmental changes (GECs). This is not surprising since we usually think about environmental health hazards from industrial, automotive and agricultural pollutants as a problem due to a ‘spanner-in-the-works’ type of contamination of the local environment. However, climate change and other human-induced large-scale environmental changes are qualitatively different types of problems. They entail disruptive systemic changes to the actual functioning of the ‘normal works’, that is to the normal functioning of the system itself. The contemporary pressures on the world’s fish stocks provide a good example of how systemic changes can jeopardize human health. Fish consumption accounts for a high proportion of animal protein in the world’s diet, especially in the coastal communities of many developing countries. However, since the mid-1980s, the total global wild fish catch has been declining and fish prices have been rising. This decline in the seas’ harvest reflects the well-known over-fishing of many of the world’s major fisheries, along with the consequences of other recent changes to the ocean environment. An estimated quarter of commercially exploited marine fish stocks are now seriously over-harvested. Several major fisheries (including the once-prodigious Grand Banks cod fishery in the northwest Atlantic) have collapsed. The GEO-4 report estimates that commercial pressures on the world’s major fisheries have resulted in more than 1400 stocks being fished, of which 240 stocks had ‘crashed’ by the year 2000 . Various actions have been taken globally, including stricter enforcement of fishing regulations, specification of marine protected areas of oceans, implementation of ecosystem management and property rights and the introduction of economic and market incentives. Meanwhile, alongside this over-exploitation by industrialized fishing fleets, other environmental stresses are emerging. As the oceans warm and as various coastal and other currents begin to change and shift, so some fish populations have begun to move . Further, the oceans are now undergoing gradual acidification as more carbon dioxide is absorbed from the atmosphere (to form carbonic acid). The calcification processes (formation of chalky structures) that are integral to the tiny creatures at the bottom of the marine food web—coral, zooplankton, copepods, crustaceans and shellfish—are very sensitive to pH. On current trends, acidification sufficient to seriously impair calcification will occur within 3–4 decades . This now precarious situation of the world’s fisheries illustrates the complex systemic way in which human pressures on the natural environment can combine to pose major threats to components of Earth’s life-support systems and, hence, to human health. There is now general acceptance that human-generated greenhouse gases are changing the world’s climate and that this process of change will inevitably continue over many coming decades. The IPCC’s Fourth Assessment Report concluded that most of the warming since 1950 is due to human actions . Recent evidence indicates that the rate of change in the world’s climate has accelerated over the past decade . The annual rate of emission of carbon dioxide in this decade is approximately twice what it was in the 1990s, and proportionately more of it is being retained in the atmosphere, as the natural sinks (oceans, forests, etc.) fail to keep up with the extra demand . The risks to human health from climate change are an inevitable component of a wider constellation of risks to climate-sensitive physical systems (e.g. ice-sheets and river flows), biological processes and rhythms, ecological relationships and social-economic conditions. Changes in climatic conditions will have many health effects, via stresses on human biology, environmentally mediated exposures (infectious diseases, food yields, etc.) and the physical risks of injury . These effects will occur via direct and indirect pathways and across different timescales. The latest IPCC report concluded that mid-latitude regions are likely to experience long-term drying, as rainfall systems are displaced towards the poles. There is debate over the role that climate change may currently be playing in the severity and duration of prolonged droughts in several regions, including south and eastern Australia, India, southern Africa and parts of southern Europe . Any such longer term shifts in rainfall zones over coming decades will have disruptive effects on agriculture and on regional food yields and, in some populations, nutritional health. The Millennium Development Goal of reducing childhood stunting will thus be further impeded. Livelihoods from fisheries, farming and forestry are at risk in many vulnerable regions of the world. The impacts of climate change on food yields and livelihoods will therefore also affect mental health and health-related behaviours. The indirect impacts on health are well illustrated by the consequences of the recent warming of the Arctic region, which is occurring more rapidly than for the world at large. The resultant loss of ice (both sea-ice and permafrost) has begun to disturb traditional living, hunting and eating patterns in the Inuit communities of northern Canada. This has caused a decline in physical activity and a greater reliance on imported energy-dense processed foods, resulting in a much greater probability of adverse health consequences, especially obesity, cardiovascular disease and the occurrence of diabetes. There is, clearly, a wide range of research needs and challenges—best illustrated by the example of climate change. 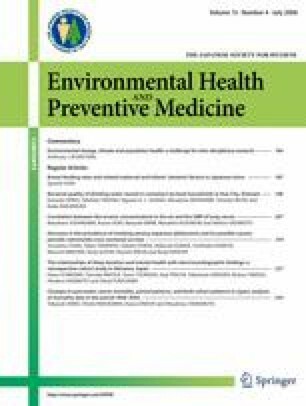 A first task for environmental health researchers and epidemiologists is to describe better the ‘baseline’ relations between climatic conditions and health outcomes (a topic that has been paid little attention over the past half-century of ‘modern epidemiology’). This will reveal the extent and form of the sensitivity of each specified health outcome to variations in climatic conditions. Then, second, there is already a need to seek evidence of ongoing changes in health risks and outcomes due to climate change—a complex task that is subject to all of the usual difficulties of multivariate influences and causal attribution. Third, by forging new collaborations with climate scientists and mathematical modelers, health researchers must estimate how future scenarios of climate change are likely to affect health risks and changes in burdens of disease. Extended collaborations with biometeorologists, social scientists, economists and others will enrich this exercise by factoring in reasonable estimations of how other modulating factors are likely to change concurrently with future climate change. Finally, there are, of course, new research tasks associated with the prevention of adverse health outcomes. For climate change this can be encapsulated as a twofold task: avoiding future unmanageable risks and, in the interim, managing unavoidable risks. That is, first, what will be the health consequences of technological and social steps taken to mitigate climate change by reducing greenhouse gas emissions? Second, what adaptive strategies can be introduced to lessen the risks from current and unavoidable climate change? It is the fact that global climate change is disrupting Earth’s life-support systems and thus endangering population health that should alert us to the profound significance of this, and other, human-induced environmental changes. Indeed, this points us to the very core of the ongoing debate about ‘sustainability’. That is, we must strive to achieve and maintain environmental and social conditions that can support human wellbeing and health into the distant future. This provides an urgent, complex and exciting challenge to the environmental health research community, especially its oncoming younger members. UNDP. Human development report 2007–2008. Fighting climate change: human solidarity in a divided world. Available at http://hdr.undp.org/en/reports/global/hdr2007–2008/; 2007.